Garden-in-a-Can from Back to the Roots. The story: two guys who turned down the corporate world after college to instead become full-time urban mushroom farmers. Along the way, they started asking about where the rest of our food comes from and created Garden-in-a-Can to hopefully inspire all of us to ask the same question. 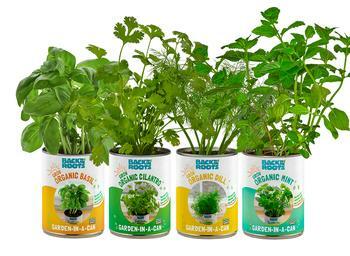 Using Biochar technology, their amazing invention allows you to grow organic dill, basil, mint, basil and cilantro right out of a can. Just pop the top and add water, it is 100% guaranteed to grow. Harvest for my months right out of the can! Experience the adventure of growing your own food, visit http://www.backtotheroots.com. Their mantra-“Food we grow, food we know”-resonates now more than ever. And if you share a photo of your growing plant, they’ll gift one to an elementary classroom of your choice. A four pack herb set is $24.99. They also offer a clever organic mushroom farm for $19.99 and a winter garden-a self-cleaning fish tank that grows plants on top-for $99.99. 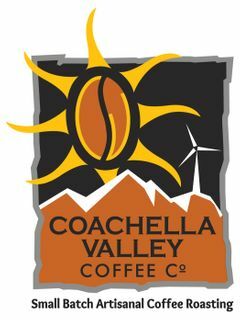 Because life is way too short to be drinking bad coffee, we strongly endorse the Coachella Valley Coffee Company, roasters of small batch artisanal coffee roasting. These people love what they do. Their works helps improve working conditions for coffee farmers, protects the environment, and promotes sustainable practices and their amazingly sumptuous coffee provides daily pleasure to discriminating coffee lovers around the globe. If you really do love great coffee go to http://www.coachellavalleycoffee.com for the perfect cup. You’ll get primo whole roasted beans. Choose from their Desert Sunrise or Sky Mountain Blend or beans from Nicaragua, Colombia, Guatemala, Mexico, Sumatra, Nicaragua, Ethiopia, French Roast or Decaf. They also have a nice selection of loose leaf teas and a few unique spices that you might enjoy as well.